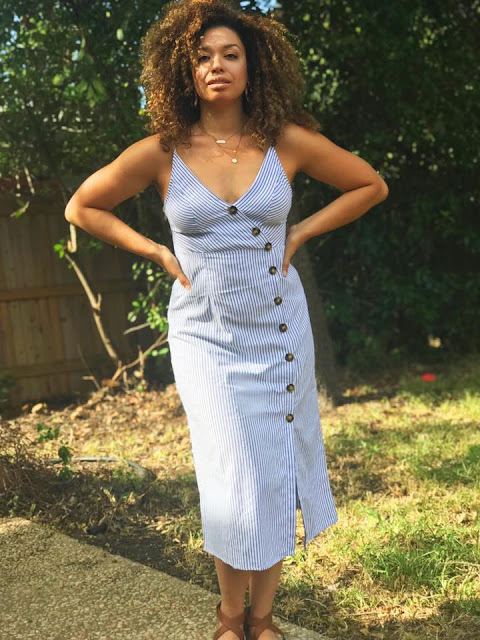 This Summer I've been going to a lot of fun events and the heat has been so insane that I had to rethink what to wear to look great and feel comfortable at the same time. This dress has been such a staple in my Summer wardrobe, I actually got it in several colors. I love that the material is fresh and the cool detail of the tortoise buttons that are purposely misaligned to create a statement. I love everything about this look! Este Verano he estado yendo a muchos eventos y el calor ha sido tan intenso que he tenido que re-pensar mi atuendo para verme bien y sentirme cómoda a la vez. Este vestido se ha convertido en una pieza clave en mi vestimenta de Verano, y de hecho, lo compré en varios colores. Me encanta la tela fresca y el detalle de los botones desalineados. Me encana todo sobre este look!